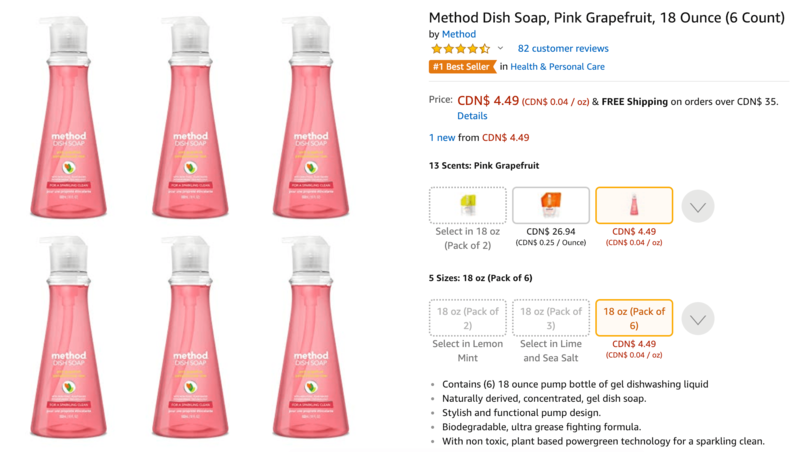 Amazon Canada has a HOT deal on this Method Dish Soap, Pink Grapefruit, 18 Ounce (6 Count). Only the Pink Grapefruit scent is available at this incredible price, other scents are currently priced at over $41 for six bottles! Naturally derived, concentrated, gel dish soap. Stylish and functional pump design. Biodegradable, ultra grease fighting formula. With non toxic, plant based powergreen technology for a sparkling clean. I this and today I checked and it states that it is only for 1 bottle, not 6! I ordered this on Feb 15 and haven’t received it yet. Amazon says it will arrive by March 14 but it hasn’t shipped yet so doubtful it will arrive by then. Has anyone received theirs? Amazon just cancelled my order staying it’s was a error. Amazon cancelled my order as well siting that they aren’t perfect and do make errors. I tried to get them to honour it or offer any credit to my account but they would not budge even after talking with a supervisor.